Why won't my subscription parameter value stick? I've set up an "Aggregate level" parameter on a SSRS report, so that I could easily schedule subscriptions for daily, weekly and monthly aggregates. The parameter has a Text datatype, and doesn't allow blanks, nulls, or multiple values. When I ran the report in preview mode in Visual Studio, the report worked as expected with all parameter values, so I deployed it to the report server. Then I proceeded to set up the subscriptions. 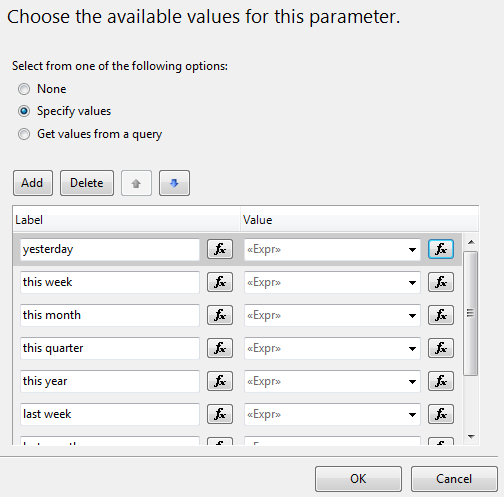 "DD" / "yesterday" being the default value, I had no problem setting up the daily subscription. How do I make a text parameter "stick" when I set its value in a subscription? Browse other questions tagged ssrs parameter reporting or ask your own question. How to pass multi-valued characters in SSRS Report? Data-Driven Subscription - how to iterate through all parameter values?